You are currently browsing the Suburban Homesteading – Frugal Living blog archives for April, 2015. Want to have a great garden along with a great life? Try these time-saving garden tips and you can have both. Spring planting time always makes me giddy as a school girl. I wait with anticipation all winter for the seed catalogs to arrive and with baited breath I haunt the mail box until the seed orders arrive. I gingerly plant the delicate seeds in starter pots, work the soil to plant potatoes and onions and work until dark without a care in the world. And when my veggies emerge from the soil I talk about my garden, to anyone who will listen, as if I’m talking about my first born child. It’s a glorious and carefree time. Then—the weeds begin to take over and the bugs descend, ravaging the growing beds. It’s then that we realize gardening is a lot of work and daily chores are the only thing that makes gardening less impossible. Using a few time saving tips early on can reduce the workload later when storms or sun threaten to squelch our garden magic, making our garden more enjoyable all season long. Mulching to prevent weeds and conserve moisture. A three to four-inch layer of mulch like grass clippings, straw, hay or shredded leaves helps hold in moisture and can cut watering time by half. Mulching when crops emerge from the soil can also help prevent weeds from taking hold. Grow a potted kitchen garden. For decades farmers and home gardeners grew often used plants like herbs close to the back door, saving footsteps to the larger garden. Potted sage, parsley and chives can be grown just feet from the cook’s domain. Plant perennials. Perennial veggies like asparagus, artichokes and rhubarb come back year after year saving time in replanting. Many herbs can also be perennial in milder climates. Try sage, rosemary, thyme, marjoram and tarragon for great herbs all year long. Create your own seed bank. Living in a year-round gardening area keeps me looking at my garden in all four seasons. Before placing an annual order I list all the seeds I want for the entire year. That way I save time from reordering and I can take advantage of specials and free shipping, saving me money. Saving seeds and also save you time and money in ordering. Supercharge garden soil. When preparing garden beds and subsequent plantings be generous with nutrient rich compost and organic fertilizer. Well-built soils help plants stave off disease and resist insects. Grow flowers to attract bugs and bees. Planting flowers that attract beneficial insects and bees helps reduce the need for pesticides and increases a healthy balance between good and bad bugs. Bee friendly flowers will help increase bee populations and in return increase pollination of fruit trees, berries and other flowering veggies. For a simple start edge garden beds with sweet alyssum or tuck it into garden nooks and crannies. Crepe myrtle can also help in warmer climates. Cover plantings with row covers. If harmful bugs can’t find your garden they can’t do damage to your plants. Garden fabric, float cloth, row covers and mesh are all fine enough to keep bugs at bay. Cover plants when transplanted and secure around the edges. The coverings can also protect plants from garden loving wildlife and the weather. Hoe weeds daily. Hoeing lightly every day will cut down young weeds and prevent them from growing larger. It is also a good time to hill up potato plants and look for garden problems while they are still small. Put tools back in their place. More time is wasted in the garden searching for needed tools. Store long-handled tools like rakes and shovels on hooks near the garden or in a potting shed or tool shed and replace them each time they’re used. Smaller tools like trowels, spades, weeders and pruning shears can be color coated with paint, markers or tape to stand out amongst a colorful garden. Stored in a bucket or basket near the entrance to the garden they will always be easy to find. Take time to smell the flowers. With all the time you saved by following these tips you can quietly relax and enjoy the garden you’ve worked so hard to create. Sit and soak up the sights of colorful flowers and growing vegetables, enjoy the sounds of birds chirping and bees buzzing, and smell the blooms of fruit trees or the deep rich soil. 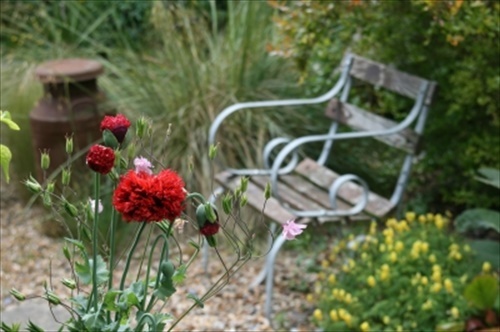 You’ve worked hard for the rewards of a healthy productive garden, so sit a spell and enjoy it! 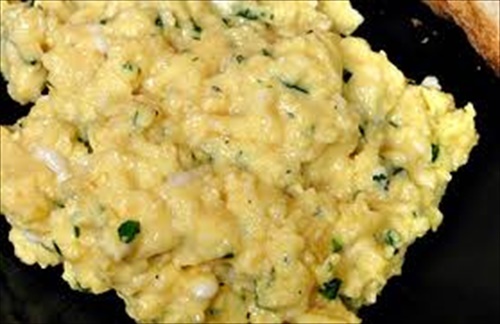 Tired of the same old plain scrambled eggs? Looking for something with a bit more style and elegance? Well, have I got a recipe for you! Eggs are the one thing most homesteaders have on a regular basis. And, sometimes we even have an overabundance of them, making eggs the center of quite a few meals. When eggs seem to make their way onto my weekly menu more times than is probably wanted I turn to my favorite Herbed Scrambled Egg recipe, the one I first discovered in France many years ago. Leave it to the French to find a way to up level even the humble egg into something that we actually want to eat several times a week. Suburban Homesteading is only part of my picture. Another part is world traveler. I love visiting other countries, exploring their culture, their history and most of all their food. It was on such a trip that I was introduced to the delicate flavor, or decadent flavor, of their morning eggs. They weren’t just plain old scrambled eggs or scrambles with cheese or bacon or ham or any of the other bits we often mix up with our scrambled eggs. These were lightly seasoned, had herbs and even a hint of cream cheese. They were sublime! Paired with fruit and toast with fresh made jam those eggs were heaven on earth. When I came home I vowed to never eat boring, plain scrambled eggs again…and I haven’t! To make your own French style scrambled eggs, mix up a batch of Herbs de Provence and start seasoning. Place all ingredients in a bowl and mix well. Store in an airtight container, like a mason jar. In a medium bowl, beat eggs with milk; mix in herbs and salt and pepper. Mix well. Over medium-low heat skillet with a small amount of butter, let pan heat up and pour egg mixture into skillet. With a wooden spatula or spoon, gently stir eggs and cook over low heat. When eggs have almost lost their “raw look” toss in pieces of cream cheese and continue stirring. Once eggs are no longer runny, but are still moist and creamy looking remove from heat. Serve immediately with sliced fruit, toast and jam. Makes 2 servings.